Reverse parking: A better way to park in parking lots. Why it’s almost always better to back into a space than pull into it head-on. 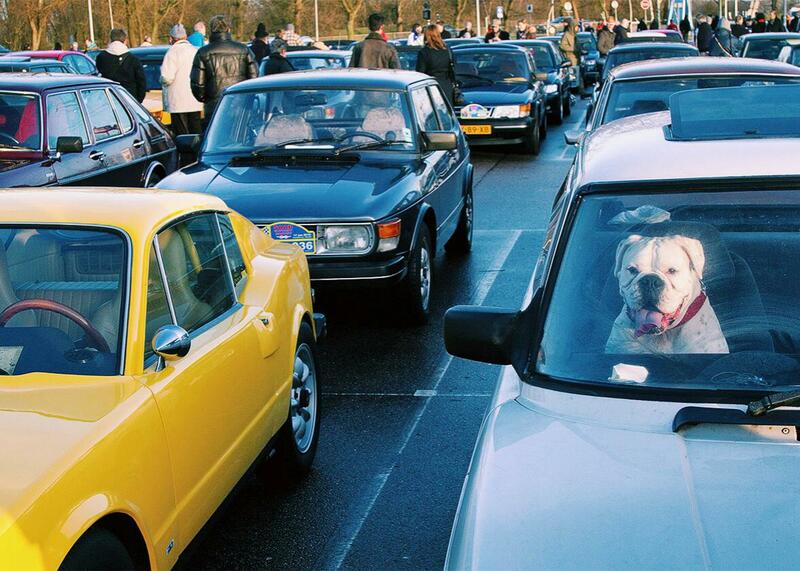 A dog guards his owner’s car at a parking lot in near Amsterdam in 2010. There are myriad moments in everyday life when some common behavior can be performed in one of two ways, thus cleaving the world into two bitterly feuding camps, capable of using strongly held convictions, pseudo-scientific explanations, and rough psychological profiling to denigrate or dismiss the other side. The most notorious instance: The great “under” or “over” toilet paper roll debate. What makes some people back into parking spaces rather than pull straight in? Is this a regional thing (in the south)? I’ve always thought that it takes much longer to back into the space and pull straight out than it takes to pull straight in and back out of the space. Jeff’s note struck a chord. This was something I too had casually noticed in the large parking lots of airports and shopping malls: Amid a long row of vehicular rear-ends, I’d spot a protuberant, defiant face. Who was this renegade? Did he have some secret agenda? Was it some kind of macho display, or some strategy for emergency preparedness? Had I encountered a practitioner of “tactical parking”? I’ve even flirted with the technique: Pulling into an empty parking space and then—seeing that the space beyond was also free, and that there was no intervening “wheel stop”—moving forward, and settling in with a vaguely illicit thrill. The practice has even been culturally beatified through its own Internet satire: “Fancy Parking” (“Have you ever walked through a parking lot and gazed at how certain cars are parked” Maybe you never knew how to describe it”). Still, I was unprepared for the response to Jeff’s query. The rapid barrage of comments about it betrayed not only an easy familiarity with the phenomenon, but a plurality of readers arguing in favor of “back-in, head-out” parking, as it is known in the trade. When backing in, I have to drive past the slot, then back in. On my way past it, I can look in the slot to ensure it is clear. I have situational awareness, so it is pretty safe to back in. When I leave, I just have to drive out and that is safer than backing out. If I don’t back in, when I leave I have to back out into what is basically unknown traffic. Backing into traffic in parking lots is more hazardous than you might think. Parking lot crash statistics are a bit hazy, particularly for crashes involving only property damage, but a study by the Insurance Institute for Highway Safety in 2001 and 2002 found that 14 percent of all damage claims involved crashes in parking lots (some number of which must have involved vehicles moving in and out of spaces). More seriously, there is a whole category of crashes, often fatal, tracked by the National Highway Traffic Safety Administration, called “backover crashes”: These typically occur in driveways and parking lots, often involve children, and happen at a higher rate to drivers of SUVs and “light-duty trucks,” owing to the reduced visibility they offer (not just to their drivers but to those parked adjacent). Indeed, the last crash I was involved with occurred when a driver backed his SUV from a parking space into my driver’s side door as I waited for traffic to clear. The driver said he never saw me, even though our cars were only a few feet apart, and it’s almost certain the crash would not have happened had the driver employed “back-in, head out” parking. If the logic of back-in parking is so clear, why doesn’t everyone do it? Difficulty, or perceived difficulty, seems to be the reigning explanation. Casual sexism (of the sort summed up by this video) holds that women struggle with back-in parking, although commenters of both genders termed it difficult on my blog. More troubling are studies that claim to find a measurable, if slight, parking “performance gap” between male and female drivers. One NHTSA study, “Field Measurement of Naturalistic Backing Behavior” (conducted to help design backup warning systems), found that “the male driver’s mean maximum backing speed was generally faster than the female’s and reached statistical significance on two of the tasks,” one of those tasks being “backing into a perpendicular parking slot.” A similar study, by Claudia C. Wolf and colleagues at Germany’s Ruhr University-Bochum, asked male and female drivers of varying experience levels to park an Audi A6 in various ways (back in, parallel, etc.) in a closed-off multistory car park. They found that women took longer to park the car than men. This might be seen as a result of the general tendency for men to take more risks in driving than women (e.g., men drive faster, closer to other vehicles, more often without seatbelts, more often under the influence of alcohol), but there was another interesting result: Even though men parked more quickly, they also parked more accurately, as measured by distance to neighboring cars. Of course, measuring these differences is easier than explaining them. Are there biological differences that give men an edge in handling a car, or do the results just reflect a wider societal belief that men should be better at handling a car? Some psychologists suggest that this belief itself affects the actual performance of drivers, in a phenomenon called “stereotype threat.” In a study in Australia, women drivers in a driving simulator who were confronted with negative stereotypes about women drivers were twice as likely to collide with a jaywalking pedestrian as women drivers not presented with the stereotype. Gender is not the only consideration. One reader reported that at his workplace, a mix of blue and white-collar workers, “the union guys back in while the white collar pull into a space.” (Another referred to a rather hazy sense of “cool” associated with back-in parking, picked up in high school and never quite shaken. Others were concerned that, once they drove slightly past the open parking spot in order to execute the turn, an impatient driver behind might simply zip into the spot. Some noted the difficulty of loading groceries when one’s trunk was nestled up close to another vehicle. And finally, back-in parking is actually illegal in many places. This is, ironically, for safety reasons (one theory is that people, since can they exit faster from a parking space, will be less vigilant on their way out than if they were backing up more or less blind).